The key difference between the economy in the short run and in the long run is the behavior of aggregate supply. 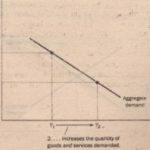 The long-run aggregate-supply curve is vertical because, in the long run, the overall level of prices does not affect the economy’s ability to produce goods and services. By contrast, in the short run, the price level does affect the economy’s output. That is, over a period of a year or two, an increase in the overall level of prices in the economy tends to raise the quantity of goods and services supplied, and a decrease in the level of prices tends to reduce the quantity of goods and services supplied. 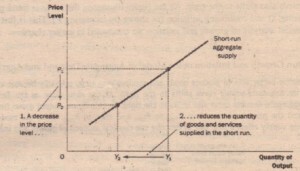 As a result, the short-run aggregate-supply curve is upward sloping, as shown in Figure 6. Why do changes in the price level affect output in the short run? Macro economists have proposed three theories for the upward slope of the short-run aggregate-supply curve. In each theory, a specific market imperfection causes the supply side of the economy to behave differently in the short run than it does in the long run. Although the following theories differ in their details, they share a common theme: The quantity of output supplied deviates from its long-run, or “natural,” level when the actual price level. in the economy deviates from the price level that people expected to prevail. When the price level rises above the level that people expected, output rises above its natural rate, and when the price level falls below the expected level, output falls below its natural rate. The Sticky-Wage Theory The first explanation of the upward slope of the gate supply curve IS the sticky-wage theory. Because this theory is the simplest of the three to aggregate supply, it is the one we in this book. The same logic works in reverse. Suppose the price level turns out to be 105, and the wage remains stuck at $20. The firm sees that the amount it is paid for each unit sold is up by 5 percent, while its labor costs are not. In response, it hires more workers and increases the quantity supplied. Eventually, the workers will demand higher nominal wages to compensate for the higher price level, but for a while, the firm can’ take advantage of the profit opportunity by increasing employment and the quantity of output supplied above their long-run levels. 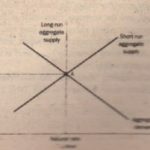 The Sticky-Price Theory Some economists have advocated another approach to explaining the upward ope of the short-run aggregate-supply curve, called the sticky-price theory. As we just discussed, the icky-wage theory emphasizes that nominal wages adjust slowly over time. 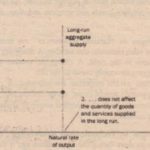 The sticky-price theory emphasizes that the prices of some goods and services also adjust sluggishly in response to changing . economic conditions. This slow adjustment of prices occurs in part because there are costs to adjusting prices, called menu costs. These menu costs include the cost of printing and distributing catalogs and the rime required to change price tags. As a result of these costs, prices as well as wages may be sticky in the short run. To see how sticky prices explain the aggregate-supply curve’s upward slope, suppose that each firm in economy announces its prices in advance based on the economic conditions it expects to prevail over coming year. Suppose further that after prices are announced, the economy experiences an unexpected contraction in the money supply, which (as we have learned) will reduce the overall price level in the long . Although some firms can reduce their prices immediately in response to an unexpected change in economic conditions, other firms may not want to incur additional menu costs. As a result; they may temporarily lag behind in reducing their prices. Because these lagging firms have prices that are too high, sales decline. Declining sales; in turn, cause these firms to cut back on production and employment. other words, because not all prices adjust instantly to changing economic conditions, an unexpected fall the price level leaves some firms with higher-than-desired prices, and these higher-than-desired prices press sales and induce firms to reduce the quantity of goods and services they produce. The Misconceptions Theory A third approach to explaining the upward slope of the short-rim aggregate-supply curve is the misconceptions theory. According to this theory, changes in the overall price level can temporarily mislead suppliers about what is happening in the individual markets in which they sell their output. As a result of these short-run misconceptions,suppliers respond to changes in the level of prices, and this response leads to an upward-sloping aggregate-supply curve. To see how this might work, suppose the overall price level falls below the level that suppliers expected. When suppliers see the prices of their products fall, they may mistakenly believe that their relative prices have fallen; that is, they may believe that their prices have fallen compared to other prices in the economy. For example, wheat farmers may notice a fall in the price of wheat before they notice a fall in the prices of the many items they buy as consumers. They may infer from this observation that the reward to producing wheat is temporarily low, and they may respond by reducing the quantity of wheat they supply. Similarly,workers may notice a fall in their nominal wages before they notice that the prices of the goods they buy are also falling. They may infer that the reward for working is temporarily low and respond by reducing the quantity of labor they supply. 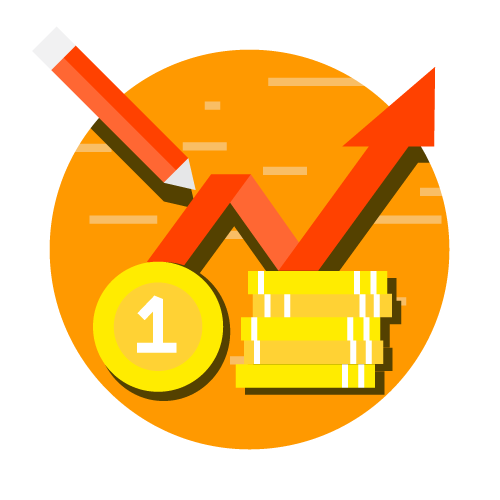 In both cases, a lower price level causes misconceptions about relative prices, and these misconceptions induce suppliers to respond to the lower price level by.decreasing the quantity of goods and services supplied. 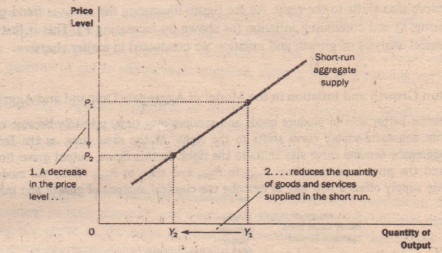 Notice that each of the three theories of short-run aggregate supply emphasizes a em that is likely to be temporary. Whether the upward slope of the aggregate-supply curve is anti to sticky wages, sticky prices, or misconceptions, these conditions will not persist forever. wages will become unstuck, prices will become unstuck, and misconceptions about re be corrected. In the long run, it is reasonable to assume that wages and prices and that people are not confused about relative prices. Thus, while we have why the short run aggregate-supply curve is upward sloping, they are all gate supply curve that is vertical.